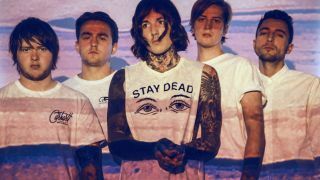 Invoking That’s The Spirit’s umbrella artwork, Oli Sykes sings, ‘So come rain on my parade / I think we’re doomed…’ over bass-heavy electronic beats. It sets the tone for the rest of the album, with sweeping dynamics framing lyrics about death and darkness. While it doesn’t sound particularly heavy, it’s heavy in theme. The most metal track on the album, with its distinctive Faith No More-influenced cheerleader chorus. If you were at Reading/Leeds Festival or saw the footage from their sets, complete with In Flames-esque lyric sing-along screens, you’ll know how big this comes off live. Sarcasm doesn’t usually sound this awesomely uplifting. An auto-tuned missive of defiance, in which Oli celebrates his success in the face of betrayal. The chorus is a huge, layered affair, referencing wolves and bringing to mind Game Of Thrones (alluded to in the video for the song). It’s a fist-pumping, pit-crushing, voice-raising celebration of triumph in the face of adversity. Never mind true friends stabbing you in the front, the electronic hook in this song stabs you in the brain – and stays there for hours. Surprisingly restrained for BMTH, screams are cut down in their prime, and the almost-out-of-control bridge is reined in by a chorus that would be radio-friendly, if it weren’t for the bitterness. At the core of this pacey, Britpop-tinged song are darkly flippant lyrics about suicide and self-harm, punctuated by the most upbeat riff of the last 20 minutes. BMTH might have moved away from their metal roots, but they still know how to make the blood pump and a crowd move. Displaying a similar vulnerability to Follow You, Oli chronicles his struggles with ADHD, letting out an impassioned cry for help. His vocals lie inside a wave of guitars, which are joined by Jordan’s electronic soundscapes for the chorus, as his words are overwhelmed like the avalanche of the title. Urgent drumming and electronic vocal samples characterise Run, which has a huge, echoing sound, and boasts yet another soaring chorus with plenty of clean singing that’ll make you want to throw your arms aloft. Make no mistake, these songs are clearly destined for arenas and beyond. Due to its then-surprising commercial sound, Drown split opinion when BMTH released it as a standalone single in late 2014 (see below). Now sitting on the album, it sounds less radical, and blends seamlessly with the other tracks, though its tempo slows the overall pace down a bit. One of the darkest tracks on the album, Blasphemy is cinematic in scope, with a seething industrial undertone and an electronic refrain pulled straight from Linkin Park’s playbook. Its ambitious, noir style is broken only by a leftfield rocky guitar solo. One of the finest tracks on the album. The party’s over for Oli, and he’s commenting on the twitchy, drug-addled people still going, via a 90s, Ibiza-style dance beat. Through the haze of an imaginary dancefloor emerges… an 80s-sounding saxophone solo. It’s unclear how they got from deathcore to this, but its testament to the band’s truly evolutionary spirit. That’s The Spirit is out now. The band will tour in November. For dates, click here.